Gutter Tex specializes in installing seamless gutters that West Lake Hills residents rely on during the rainy season. As a suburb of Austin, West Lake Hills averages nearly 62 inches of rain a year. Rain usually comes in condensed bursts including days with 10 to 15 inches of precipitation. These intense downpours are the number one reason to have gutters installed by an insured, experienced team with the know-how to safeguard your home. Our team climbs the ladders for you and hangs the best gutters with professional expertise. If you are replacing damaged gutters, we can fix siding and trim while onsite. The Gutter Tex team is committed to customer satisfaction, green business practices, and providing West Lake Hills homeowners a high-quality experience. We offer a five-year limited labor warranty and carry $2 million in liability insurance and workers’ compensation insurance. 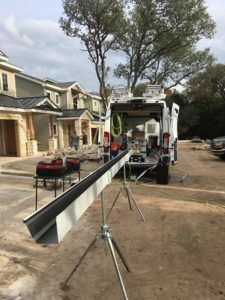 In addition, a portion of the proceeds of every gutter installation project is donated to local charities including Free to Breathe, ALS Association, Cory’s Crusaders, and Central Texas Dachshund Rescue. Seamless gutters are aluminum. They install in one piece with no welding between the sections, making them stronger. No seams mean less maintenance for homeowners. Seams are famous for trapping leaves and twigs, which means you need to keep cleaning the gutters. Without seams, homeowners do not need to climb up a ladder to empty clogs. Aluminum does not rust, making it an ideal choice for gutters. Plus, the enamel coating on the outside will not peel like paint. Both options mean your new gutters will last a long time and keep your house looking like new. Gutters are an important part of any home. They move excess rainwater away from the foundation of your house, preventing costly problems. Erosion, pooling, insect breeding, and cracks in the foundation can all occur because of too much water around the perimeter of your home. Without gutters, your home can incur water damage, especially in heavy rains. There are multiple options for moving excess water away from your home. Downspouts, rain barrels, and rain chains are all options to consider. Gutter Tex can help you decide on the best method of removal for your home in keeping with the aesthetics of your property. The trim around and behind your gutters can hide mold and mildew. The first sign there is a problem is usually peeling paint on the surface of your home. Paint will not stick to rotting wood, so if you see peeling paint, it may be a sign of a bigger problem. Gutter Tex comes prepared to replace the trim under your gutters, saving you another repair bill down the road and structural damage to your roof. Gutter Tex offers many options and standard practices to meet your goals. We can help you protect the environment, save money, give your home a unique look, and repair damage. Schedule your seamless gutter installation in West Lake Hills, TX online or call us at (512) 298-5286 today. ✔ Fully insured and bonded. ✔ Dozens of 5-Star Reviews. Monday - Friday: 7 a.m. - 10 p.m.
Sunday: 8 a.m. - 5 p.m.